The concerto for one or several solo instruments and strings was one of the most popular genres of instrumental music in the 18th century. It came into existence around 1700 and it was especially the type of concerto, developed by Antonio Vivaldi, which was embraced across Europe. However, some composers still preferred the older form, which was modelled after the sonata da chiesa of Corelli. One of them was Georg Philipp Telemann. His contributions to the genre of the concerto with solo instruments are substantial, although he more than once expressed his preference for the French style, which came especially to the fore in the orchestral overture or suite. 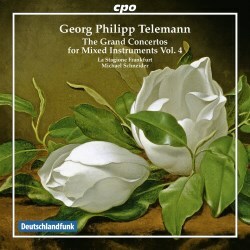 Telemann was very much his own man in everything he did. That is also the case in his approach to the genre of the concerto. The present series of discs, devoted to concertos for wind and strings, recorded by La Stagione Frankfurt for CPO, includes striking examples of his creativity and originality. Take the Concerto in F (TWV 54,F1) which has seven movements. It is a hybrid piece, which includes features of the concerto - the first three movements in the order fast, slow, fast - and the orchestral suite, as the last four movements are dances. As so many of Telemann's concertos, it has been preserved in copies, in this case written for the courts of Schwerin and Dresden respectively. In these copies the concerto is scored for two horns, two violins, recorder, oboe, strings and basso continuo. However, an in-depth study of this piece has shown that originally Telemann included two parts for chalumeaus. As in Schwerin and Dresden these instruments were not available, this concerto was strongly adapted. The original version cannot be reconstructed, and therefore here the version from Schwerin is performed. Notable is the fact that the second fast movement is a repeat of the opening movement. The bourrée comes in a pair, and the menuet originally also included a central section, of which only the two horn parts have survived. The various movements are allocated to different combinations of instruments. The horns play a central role in the menuet and the closing gigue, but the second movement, a scherzando, is a dialogue of recorder and violin, with the tutti strings playing pizzicato. The Concerto in F (TWV 44,41) is in four movements; here it is the texture, which is notable. There are no extended solo parts: it is scored for two recorders, two oboes, two violins and basso continuo, without a body of ripieno strings. It is one of several concertos, in which groups of instruments are juxtaposed. The best-known of these is the Concerto for three oboes and three violins in B flat (TWV 44,43), sometimes called a Septet. The scoring refers to the 17th century, when all instruments were treated on equal footing; it is assumed this concerto dates from Telemann's years in Eisenach (1707/08-1711). The most remarkable movement is the third, an adagio, because of its striking modulations within just 32 seconds. One may wonder why the Concerto in D (TWV 53,D2) for trumpet, two oboes and strings was not included in the series of discs devoted to concertos for winds. This issue is not discussed in the liner-notes. The reason may be that, as in the concerto just mentioned, the winds don't have real solo parts. Again this is a concerto of an older type, in which the winds are more or less integrated in the musical discourse. In the booklet Wolfgang Hirschmann here quotes Johann Gottfried Walther, who in his Musicalisches Lexikon of 1732 describes this type of concerto as a work, in which "each part stands out at a certain point while competing with the others". The middle movement is in three sections: an aria for the two oboes, embraced by short adagios for the strings. The trumpet keeps silent here. Another early piece, probably written in Eisenach, is the Concerto in c minor (TWV 52,c1), which opens the programme. It is scored for oboe and violin, and it is interesting to compare this piece with Bach's concerto for the same scoring (BWV 1060), which probably was the original form of what has come down to us as a concerto for two harpsichords. Bach follows the Vivaldian ritornello form, in which the two solo instruments have extended solo parts. That is not the case here: the solo episodes are rather short, and the whole concept of Telemann's concerto is dominated by the tutti. The disc ends with what is probably one of Telemann's most remarkable concertos. The Concerto in e minor (TWV 53,e1) is scored for violin, two transverse flutes and strings. The flutes don't have solo parts; they only play in pairs. The key of e minor was considered plaintif by Johann Mattheson, and that is reflected by this concerto, also because all four movements stick to this key. Chromaticism and the use of the fugue in the second movement emphasize the serious and rather stern character of this work. The closing presto has the rhythm of Polish folk music, but it doesn't really brighten up the mood. It is, according to Hirschmann, what Telemann himself described as "merry earnestness", a probably lesser known feature of Polish folk music. This disc brings together five concertos of a very different character, in texture, mood and scoring, as well as in the way the solo instruments are treated. That way it is an impressive testimony of Telemann's creative powers and his independence, in the way he treats the forms in vogue in his time. Sometimes I find the performances of La Stagione Frankfurt a bit too restrained, but here I am really satisfied with its interpretations. The oboists and the horns are excellent, although in the case of the latter, as well as the trumpets, I find it a little disappointing that Schneider did not decide to turn to real authentic instruments and playing styles, avoiding modern additions in the interest of intonation. The long Concerto in F and the closing Concerto in e minor are definitely the highlights of this disc. The latter shows that Telemann is not only the composer of happy and merry music.